In many atmospheric chemistry campaigns, the measurements and scientists are focused in one field. For example, the campaign I participated in for my graduate degree, the Deep Convective Clouds and Chemistry campaign, the research focused on deep convection (lightning storms) and the impact of deep convection on chemistry. Similarly, the work I did this summer, focused on urban chemistry. However, for ATom, the scientists making the measurements must wear many hats, as we are sampling numerous different environments and parts of the atmosphere. So far during this mission, we have sampled three different geographical regions while sampling numerous altitudes of the atmosphere while we fly to those regions. During each flight, no matter where we are going, we will fly between 1 to 10 profiles, sampling from ~500 feet above ground level to ~32,000 – 38,000 feet above ground level. Once we are at these levels (think region that most commercial airplanes fly), we maybe sampling the stratosphere. This region is important for protecting the environment from strong UV rays (sunburns), and understanding the transport of pollution in this region is important to investigate if the ozone layer is improving. Also, looking at the differences between the chemical make-up at each altitude will provide valuable insight about transport and chemistry. 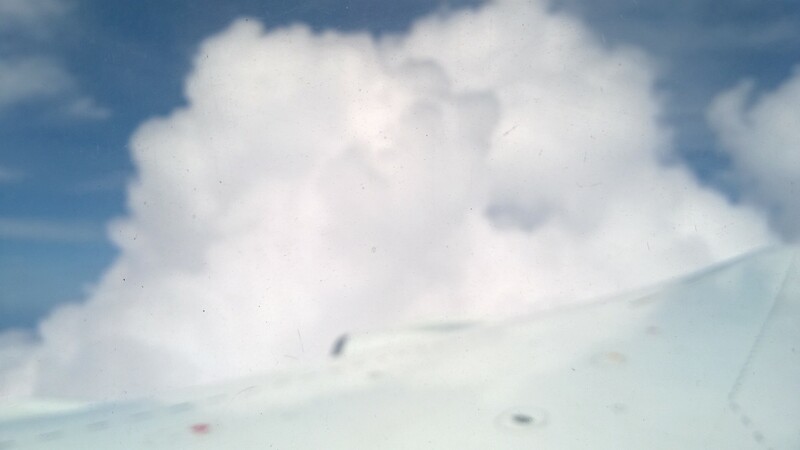 DC-8 sampling tropical air, somewhere between 4000 – 8000 feet above ground level. For the first three flights during the mission, we have sampled tropical regions and polar regions. First, we flew along the coastline of North and Central America to investigate what is being transported to this region over the Pacific Ocean, as well as to sample the difference between summer northern and southern hemisphere. Next, we flew to the Arctic Ocean, north of Alaska and Canada, to sample summer polar background air. We observed that the ice was not solid, even to 80 degrees North, and the ice appeared to be first year ice. 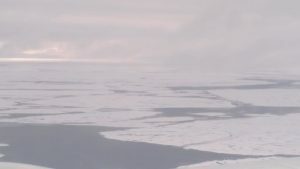 The comparison of the remote polar background during all of the seasons will be important to understand the importance of chemistry versus transport, and how this pollution impacts snow cover and other environmental aspects of the Arctic. Broken ice over the Arctic Ocean north of Alaska and Canada. Finally, we have flown to Hawaii, which has provided us the opportunity to investigate the differences between the transport and amount of pollution in the remote atmosphere between the Arctic and Pacific tropics. 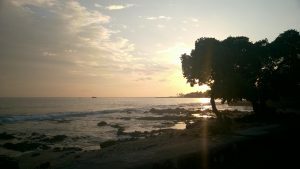 Picture of sunset in Hawaii. We will be flying to three other regions over the Pacific Ocean prior to flying to the remote Atlantic Ocean. I will be posting updates about the next two flights next week.